Mira® Pro x64™ is a native 64-bit Windows application that utilizes the memory and speed advantages of the 64-bit Windows operating system for processing very large images. Mira Pro x64 has no peer for speed, features, and its seamless integration of image display, plotting, processing, measurement, and analysis. While other image processing application software may provide only GUI-based commands or scripting for built-in commands, Mira Pro x64 is unique in integrating all workflow modes: Interactive GUI-based processing, Batch processing of files, Scripted processing, and using Mira's programming extension language to easily and quickly create powerful scripts for nearly any purpose. The 64-bit advantage provided by Mira Pro x64 expands the possibilities into applications impossible with 32-bit software. Application areas: Astronomy, space sciences, imaging of discrete sources, research and education. Mira integrates one of the fastest and easiest to use, completely extensible, programming extension languages in existence. Creating high SNR master images by combining very large image sets. Searching for similarities between images or for transient phenomena by blinking or animating large image sets. Cleaning cosmic ray events from image sets using statistical methods. Registering many large images using interactively selected match-points. Processing large image sets with "undo" capability enabled (as that makes a duplicate copy of each image). Doing many instances of such processing in different windows open at the same time. Mira Pro x64 includes our Pro Script™ programming extension language based on the easy to use, fast, and powerful Lua® programming language. Pro Script allows you to create scripts that work with images and other data for scripting repetitive and custom tasks, developing and testing algorithms, creating simulations, and doing countless other programming chores. Also included are hundreds of fast, powerful functions that are easily implemented in your scripts. One year of maintenance is included. After one year, discounted annual maintenance is available to provide tech support and keep your software current. Mira Pro x64 makes it easy to make research quality photometric measurements of any number of stars with any number of standards on any number of images. Doing ensemble photometry, plotting light curves, importing objects from target lists, and reporting results are a snap! 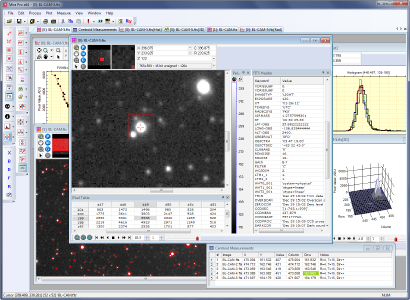 Use Mira Pro x64 as a powerful, general-use tool for astronomical research, including areas such as variable star research, exo-planet search, milli-mag level photometry, supernova patrol, minor planet detection & rotation studies, and data mining. Extensive and powerful, yet easy to use, scripting language for processing images and other data, including our powerful File Event Scripting capability. Work with FITS and other standard image formats using 8 to 64-bit numeric data plus 24-bit and 48-bit color. Mira Pro Ultimate Edition (32-bit version). 64-bit Windows x64 Operating System in version 10, 8, 7, or a 100% compatible Windows environment on Linux or Mac. Hard Drive Space: 120 MB, including sample images and scripts.